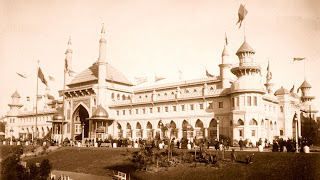 The Midwinter Fair's Mechanical Arts Building was located on the South side of the Court of Honor, and was the second largest building on the grounds. Designed by architect Edward R. Swain in an East India style, the building was painted ivory, with turquoise, yellow, vermilion, and gold details. A central pavilion, topped with a red-tile roof, featured a large Hindu style archway which formed the main entrance to the structure. 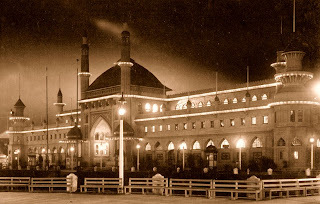 Two 120-foot high minarets flanked the main entrance, with golden-domed kiosks located at their bases, while four additional minarets and towers were located at the building's corners. 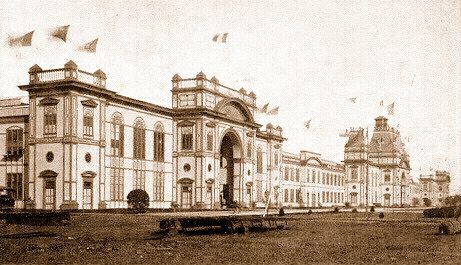 The interior contained scores of machinery and electrical exhibits, as well as the exposition's main power plant, located at the rear portion of the building. By night, the structure was outlined with numerous electric bulbs. At the close of the fair, the building was demolished, and the California Academy of Sciences museum was later constructed on the site.